UV rays can cause your pictures to blur and lose their brilliancy. Especially around noon you have to expect strong UV rays. By using a DHG UV Filter you prevent UV rays from shining through and your pictures will keep their brilliancy. Furthermore SOLIGOR DHG UV Filters protect your valuable front lens from scratches, finger prints, dust, dirt, and splashing water. As they render a fully neutral coloring, you can even leave your UV filter on the lens. By the way: we deliberately excluded Skylight Filters from our DHG sales program as they are not recommended for use with digital cameras. The slight coloring of the skylight filter may negatively effect the camera's auto white balance function. The higher the pixel count of the digital camera's image sensor, the more light is reflected by it. In order for the reflected light leaving the optical system lineally, lenses and filters with best possible coating of all glass and air surfaces are essential. Otherwise diffused light reduces the image contrast and sharpness. Thus SOLIGOR offers filters which are coated on both sides with the newly developed "Digital High Grade" coating. 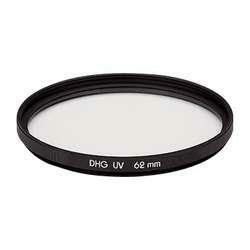 This guarantees you best possible image results as the rest reflection of DHG filters is reduced to less than 0.5%. For the same reason the glass edges of the filters are blacked and the metal mount has a reflection-free black matt finish. The mount is especially narrow to prevent vignetting (shading at edges) when using wide angle focal length. The mount is, depending on the diameter, only 3 to 6 mm thick, still it features a front thread to attach further accessories such as a lens hood.